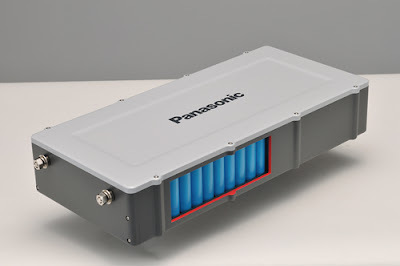 According to Physorg, Panasonic will market a battery for home use beginning next year. They claim it will power a house for a week, which does not tell us much. Your average American house consumes far more energy than your average Japanese house. At some point they will publish actual ratings for us to ponder as they did in an earlier press release announcing the production of a battery for light electric vehicles and one for storage, apparently smaller than the one shown above. Many solar enthusiasts are excited because they will finally have a decent battery to store sunlight in (assuming it is affordable). It will charge and discharge rapidly, and last for a decade or so, like most other major appliances. One day, all states will allow net metering. Net metering laws allow you to gain credit on your electric bill for the solar energy your panels contribute to the grid (the energy you could not use when the sun was shining so brightly). Where I live, you get a year to use up the solar energy you contribute to the grid and the amount of electricity you are allowed to contribute is enough to actually power an average American home. This is generally simpler and cheaper than trying to store your own electricity in the only affordable batteries available today--the clunky, short-lived lead-acid design that was also used in WW I submarines. From a utility company's perspective, net metered solar panels are essentially appliances that turn off the light switches in your house and many of your neighbor's houses. They can't charge for power they did not generate, or to put it another way, they can't charge for power not used (your panels effectively turned off a lot of light switches by removing load). This battery might cost less than the installation charge for connecting your system to the grid. It may finally be more cost effective to stay off the grid. It can also be used as an emergency power source (like a generator) during outages. Batteries like this are the death knell for fuel cell and reciprocating engine backup generators. It does not have to be charged with solar power for that purpose but certainly, you would get a lot more bang for your buck if it were combined with solar, and with solar you would also get emergency power backup. This is an example of technology begetting technology, creating an exponential benefit. (Photo credit catchesthelight via the Flickr Creative Commons license). Why does Bob Dinneen, CEO of the Renewable Fuels Association (an organization that just spent almost a quarter of a million dollars last quarter lobbying for corn ethanol) have a blog in the Huffington Post's environmental forum? Why not give a spot to the ACCCE so they can use it to tell us how clean coal is? The RFA has been retained to defend a client--corn ethanol. It is analogous to the NRA, which is currently fighting to keep lead bullets legal in Arizona even though they are poisoning California condors. 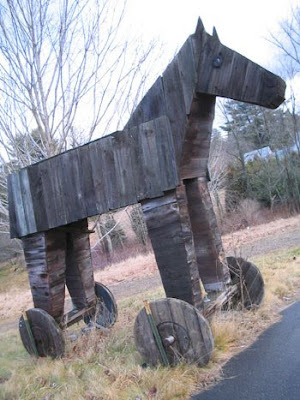 The RFA's claim to support all biofuels is a Trojan Horse to hide corn ethanol in. The last thing the corn ethanol lobby wants is a competitor that can make ethanol cheaper than they can. Right now the only feedstock that can do that is sugarcane and that is why they continue to support the tariff against it. If or when another feedstock becomes cheaper, they may well find a way to thwart it as well. "Consensus in Copenhagen? Replace Gasoline with Biofuels!" "Transportation accounts for 25 percent of the world's greenhouse gas emissions"
Transportation accounts for about 12 percent of GHG, not 25 percent. He is off a modest 100 percent. "Delegates to Copenhagen may not know it, but the limousines in which they are riding are running on ethanol made from straw." "..Denmark’s Inbicon today [one month ago] opened its first demonstration facility producing cellulosic ethanol, but potential customers will have to wait. Inbicon has already sold its first year of production to Statoil, which plans to blend the ethanol into the Danish fuel supply early next year. In addition, some of the ethanol is being reserved to fuel E-85 vehicles during next month’s COP-15 meeting in Copenhagen.."
Immediate action is needed to increase the production of biofuels of all kinds, particularly for use in the transportation sector"
Most climate experts agree (Jim Hansen in particular) that coal is the biggest problem, not gasoline. And you would only want to promote biofuels that actually reduce GHG emissions. Corn ethanol, which accounts for 99 percent of the ethanol used in the United States does not fit that bill. "Fortunately, one solution is already available. With the support and coordination of governments and international bodies, existing and emerging biofuels can continue to replace the use of gasoline and reduce the emission of greenhouse gases." Actually, the only biofuels that produce less GHG than conventional petroleum are those made from waste and from sugarcane grown on degraded or existing cropland. And another solution that is readily available are high mileage cars like the Prius, Insight, Civic hybrid and on and on which produce about 100% less GHG than America's present car fleet average. "In 2008, the 9 billion gallons of domestic ethanol produced and consumed in the US resulted in a reduction in greenhouse gas emissions comparable to removing 2.1 million cars from the road." That 9 billion gallons of ethanol (which usurped about thirty thousand square miles of cropland) all came from corn and 2.1 million cars represents only about one percent of our registered cars. About 70 percent of corn ethanol comes from fossil fuels. The thirty thousand square miles of corn fields diverted to gas tanks displaced carbon sink land outside the US, and the large amounts of fertilizer created large amounts of nitrous oxide (hundreds of times more potent than CO2). When accounting for fossil fuel input, land displacement, and fertilizer generated nitrous oxide, corn ethanol likely produced far more GHG than the gasoline it displaced. "This year, the world is expected to produce 80 billion liters (around 21 billion gallons) of ethanol, replacing the need for 1.9 billion barrels a day of crude oil." A commenter in the Huffington Post article pointed out several days ago that the above sentence makes no sense. The world consumes about 86 million barrels of oil a day. About 1% of global oil consumption replaced by ethanol. "It is estimated that the global production of biofuels will reduce greenhouse gas emissions by 123 million tons in 2009 alone. Such an impressive and growing environmental benefit stands in stark contrast to the environmental footprint of the petroleum industry which continues to worsen." That estimate, wherever it came from, is likely 100% wrong, and I would not call it impressive. Assuming he meant metric tons CO2 equivalent (I doubt he has any idea) 123 million tons is minuscule (a fraction of a percent) in comparison to total global emissions. "Researchers from the University of Nebraska have reported that, compared to gasoline, today's ethanol reduces direct greenhouse gas emissions between 48 percent to 59 percent." Those values are estimates for the newest biorefineries, not an average for all existing refineries. I love how he quotes research that supports his product while simultaneously denigrating researchers with findings that don't support his product. The researchers also state in the Nebraska study that this does not include GHG from land displaced nor does it include the latest findings for nitrous oxide release which suggests corn ethanol is up to 50% worse than gasoline. "According to the U.S. Department of Energy's Argonne National Laboratory, ethanol produced from these cellulosic feedstocks has the potential to reduce greenhouse gas emissions by more than 85 percent, compared to gasoline." Bait and switch baby. The RFA is using the potential of future non-food based fuels as a Trojan Horse to hide corn ethanol in. "Meanwhile, as conventional oil is depleted and exploration shifts to unconventional sources such as tar sands, shale and the deep sea, finding and using petroleum will require more energy and release more greenhouse gases." The above sentence is the first accurate one in this article. However, the environmental impact of biofuels are already gargantuan and will only get worse as biofuel production increases. "All of this is occurring against a backdrop of increased agricultural productivity activity." I took the liberty of editing that sentence. The number of hungry human beings just passed through a billion for the first time. A recent paper in Nature demonstrates that our agriculture is primarily responsible for exceeding planetary nitrogen boundaries. I talk about it in the following article titled "Transgressing identified and quantified planetary boundaries." "Vast tracts of arable land remain unused. As the Food and Agriculture Organization of the United Nations has reported, there are, at present, 1.5 billion hectares of land used for farming. That is only 11 percent of the world's surface area, and almost twice as much arable land - 2.8 billion acres - remains unused. With new magical farming technologies, this land can be responsibly and sustainably managed to provide a growing population both food and renewable fuel." The above paragraph is nonsensical gibberish. If there is so much arable land going unused why don't we grow corn for biofuel there instead of using our rich, fertile farmland? That's a rhetorical question. Everyone knows that answer--cost. "That is why it is so encouraging that the developing world has huge supplies of the "biomass" (wood and plant wastes) that will be the feedstocks for the next generation of biofuels. As one recent study concluded, biomass could fuel 65 percent of the world's energy consumption by 2050. Sub-Saharan Africa, the Caribbean and Latin America account for about half of this global potential." The above paragraph got a chuckle out of me. Sub-Saharan Africa, the Caribbean and Latin America account for about half of this "wood and plant waste." By waste, I suspect he means "ecosystems not yet destroyed by humanity." "These facts stand in contrast to those who argue biofuels are destroying the land and responsible for deforestation." See what I mean? By using the word "those" he is denigrating not just the science, but the scientists that have demonstrated that instead of trying to grow crops on degraded and denuded land, farmers tend to clear virgin land to grow crops when price signals (corn ethanol hogging up 30,000 square miles of land and doubling the price of corn) suggest they may profit from creating that new cropland. That's what slash and burn agriculture is all about. "Yet, forest land in the US has been increasing at the same time that ethanol production has grown." That would of course prove nothing, assuming it is even true. More land is being planted with corn to capitalize on its high price. That land is not coming from protected American forests. "Moreover, global deforestation has slowed as global biofuel production has accelerated. The development of biofuels could fuel the economies of developing countries, reducing the desperation that produces deforestation by illegal logging, cattle ranching, and subsistence farming." Global deforestation has slowed with the economy, but it would have slowed even more without the demand for biofuels. Biofuels won't reduce "the desperation that produces deforestation by illegal logging, cattle ranching, and subsistence farming." It will add to the destruction being caused by those things. Biofuels are a new demand on the biosphere. "Energy security, economic growth, and environmental responsibility: These are three reasons why the Copenhagen climate change conference should create a new consensus, among developed and developing nations, to encourage the production and use of biofuels." Corn ethanol does not provide any meaningful energy security, economic growth (it would disappear in a year without government largess), or environmental responsibility. This review follows on the heels of what the media has dubbed climtategate--a textbook example of how to make a mountain out of a mole hill. A few weeks prior to that brouhaha, the media was awash with reports that the world is actually cooling, which upon closer inspection also amounted to nothing. Sticking with mole analogies, correcting the disinformation perpetuated by those who seek to discredit climate research has become a perpetual game of Whac-A-Mole. The book does a very thorough job of documenting the history of sometimes despicable attempts by various vested interests and contrarians to discredit climate science. There is no doubt which side holds the science high-ground on this issue and after reading this book there should be little doubt which side holds the moral high-ground. It gets off to a slow start but hang in there. It gets better, ending with a bang. It is not a neutral perspective of the pros and cons of the global warming debate. This is a detailed, no holds barred account of the people who work to discredit climate science and the methods they use to do it. The authors begin with a critique of octogenarian Freeman Dyson, the world’s most notable global warming skeptic. Dyson is in a class of his own and does not deserve to be lumped in with the usual ignoramuses, cranks, and conspiracy theorists. I suspect his mention at the front of the book was one of those last minute edit jobs in response to a NYT article about Dyson’s skepticism just prior to the book’s release. 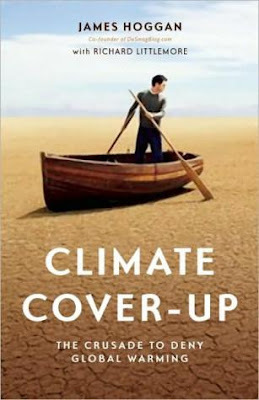 Climategate, the latest global cooling farce, and Dyson’s skepticism are all examples suggesting that an updated version of this book a year from now might be twice as long. Dyson is an icon in the world of science and scientists don’t like it when anyone takes a pot shot at one of their heroes. Dyson is by all accounts a genius. He probably thinks people who use calculators are sissies. Back in the seventies, Dyson published a paper which calculated that we could stabilize carbon in the atmosphere by simply planting a trillion or so fast growing trees. Intellectually speaking, I am but a speck of dirt on the bottom of one of Dyson’s shoes, but people who once proved brilliant in their field of expertise rarely prove to be quite so brilliant in unrelated fields, like climatology. Michael Jordon comes to mind. Some climate models suggest that planting trees in the upper latitudes would have a warming effect because they would reduce reflectivity of snow on the ground. If true, this is an example of how humanity has already reached some points of no return. Out of curiosity, I just fired up a spreadsheet to calculate how much land mass a trillion trees would cover spaced at five foot intervals with a five foot square boundary around each. Dyson could probably do this in his head. Maybe I have a decimal point in the wrong place but according to my calculations they would cover the Earth’s landmass dozens of times over unused arable landmass more than twice over (see comment by Pete S). “I’m still perfectly happy if you buy me a Prius!” Imme [his wife] said. 1) The ice age hypothesis was short lived, not widely accepted, and blown out of proportion by a lay media looking for sensationalist headlines, as always. 2) If we attacked all of the world’s problems (like overfishing and species extinction) linearly (one at a time) instead of in parallel, the sun would go dead before we got to the end of the list. 3) A Prius is not a toy for the rich. Dyson is also a big proponent of solar power, so, go figure. Skepticism is one of the keystones of science and anyone who wasn’t skeptical when they first heard about global warming should contact me so I can sell them some land in Florida. Likewise, the word skeptic might be appropriate for those who have been living in caves for the last decade and have just caught wind of the concept, but what do you call someone who refuses to move to the next stage regardless of the evidence? The word denier was used 36 times in this book. Denial is also the first stage listed in Elizabeth Kübler-Ross' book, "On Death and Dying." (see the Wikipedia article on the Kubler-Ross model). Denial is the overarching reason for a belief in an afterlife. Acceptance of the results of decades of global warming research is not by any means tantamount to accepting one’s eventual demise, but the potential ramifications of global warming appear to be enough to send many people scurrying for their ostrich holes. Much of the denial we see is probably related to the potential ravages of global warming. If the research results were suggesting that global warming has little potential and would have little impact, I doubt there would be any debate at all. Few of us will live an entire life without facing situations that we find so threatening that we deny they are true, at least at first. Coping mechanisms help us deal with unpleasant realities until we can gather ourselves and face them, or not. But some people have become very adept, maybe too adept, at capturing the anxiety relief denial can provide especially when doing so will not have a negative impact on their daily lives. They have a hair-trigger reality switch that has been honed to a shine by repeated use, and few people who do it are consciously aware that they do it because awareness would deactivate the switch. We of course pick and choose our denials. You could deny that walking in front of a speeding bus is dangerous but you would also be taking a big personal risk. Unlike some forms of denial, denying the potential ramifications of global warming entails no physical danger to the denier, only anxiety relief. It is custom-made for using denial as a coping mechanism. However, a prolonged and collective denial by enough people may have an impact on our children’s and grandchildren’s lives by radically altering the world they will live on. Collective, self-reinforcing denial may have been what brought the Easter Island civilization down. There are plenty of other reasons not to accept the findings of decades of global warming science. You may just be ignorant or misinformed, or have a contrarian personality disorder that is not constrained by logic and evidence (conspiracy theorists fall into this group), but whatever reasons you have, they are not backed by science, regardless of what you may have told yourself to the contrary. An earlier review by Roberts can be found here on Grist. Denier debunking is like trying to kill zombies that won't stay killed. ...the first entry that pops up is his 1977 [book] paper published in the journal Energy titled: "Can we control carbon dioxide in the atmosphere". ... Dyson is probably a bad early target for Hoggan, who should have stuck to the corporations (worthy of his energy), rather than making false claims about a venerable scientist. Climate Cover-Up recovers from this slip up but, as the old African proverb goes, one falsehood can spoil a thousand truths.